If there is a hockey gene the Patterson family carries it. Like the Sutters, the Patterson brothers were a hockey-playing quartet with superior skills on the ice and although not all of them were destined for fame abroad, they are heroes in Hythe and respected throughout the Peace River country. Street hockey with his three brothers in front of the family home in Hythe, Alberta are Jim’s first memories of the game. Later the Patterson boys and neighborhood pals would build a fire and then shovel snow from the neighborhood outdoor rink in order to scrimmage. On Saturday evenings their ears were glued to Hockey Night in Canada with Foster Hewitt. Following Hockey Night in Canada, if the local Mustangs were playing out of town, they would tune in the play-by-play of CFGP’s sports announcer, Fran Tanner. For free admission to watch a senior Mustang home game, Jim and his fellow rink rats scraped the ice. Free hot chocolate was part of the deal. As a hardy fifth grader Jim remembers curling up with teammates and hot rocks in the back of a straw filled truck to play against teams in the nearby towns of Beaverlodge and Pouce Coupe – no seat belts provided. As a junior Jim narrowly missed the cut to play for the Lethbridge native sons where his brother Harley was playing. He returned to Hythe to finish school and play for the Mustangs. Jim has vivid memories of his last hockey series with the Hythe Mustangs playing against their archrivals, the Grande Prairie Legion. For the final game two thousand fans crammed into an arena designed for 1200 spectators. Hythe won the series. In 1953 Jim graduated from high school and moved to Grande Prairie where he played with the Grande Prairie Red Devils alongside Hockey Legends Charlie Turner and Leo Auger. A chronic knee injury ended Jim’s participation in hockey as a player. Jim loved to play the game and was a skilled player but his greatest contributions to the sport have been in other roles. He managed a Peewee team that participated in an exchange program with a team from Alaska, played in an international tournament in Kamloops and won a Provincial championship. At the Midget level he managed teams that again went to the Provincial Playoffs and competed in two Wrigley Alberta qualifying tournaments. In 1976 and 1977 Jim managed Bantam rep hockey and the Midget Knights who played for the Air Canada Alberta championship in Red Deer. In this tournament the Knights received recognition for their discipline both on and off the ice; a testimony to Jim’s positive influence on players that emphasized not only skills and sportsmanship on the ice but character development in a wider context. Building on his extensive experience and contacts in hockey, Jim combined with Brian Nash to conduct hockey schools with instructors that included Legends Doug Rigler, Ken Solheim and other talented young players whose development he had nurtured. Jim’s volunteer activities covered every aspect of the game. Concurrent with his first experience as a manager he served on the executive of the South Peace Hockey (SPHL) including a stint as President. While serving on the executive he provided impetus and guidance for an important revision to the SPHL constitution and contributed to the production of the first SPHL record book. In addition to managing teams Jim served on the executive of the Grande Prairie Minor Hockey Association including one year as President. With the recognition that facilities for minor hockey was inadequate, Jim teamed with fellow volunteer, John Boyle, to develop the Lewis Hawkes Pavilion, an indoor natural ice facility where Legends such as Ken Solheim Doug Rigler developed their skills. Jim and John spent long sleepless nights in order to apply the frequent flooding that was necessary to prepare the natural ice. Later Jim served as President of the Junior North Stars: a building block for the Grande Prairie Storm. In 1981, Jim turned his attention to revive and rebuild the Grande Prairie Senior Athletics accepting the role of President in 1981. Jim was a founding committee member of the Hockey Legends of Grande Prairie and served in this capacity until 2004 when health problems forced his resignation. 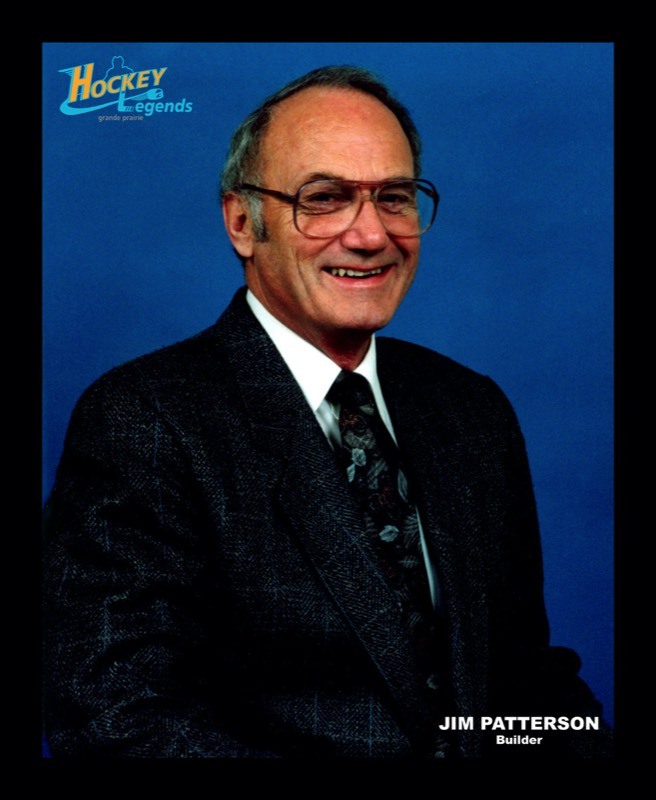 Jim Patterson - a Grande Prairie Hockey Legend in 2006.